We, Filipinos, are not hard wired to save, more so to invest. 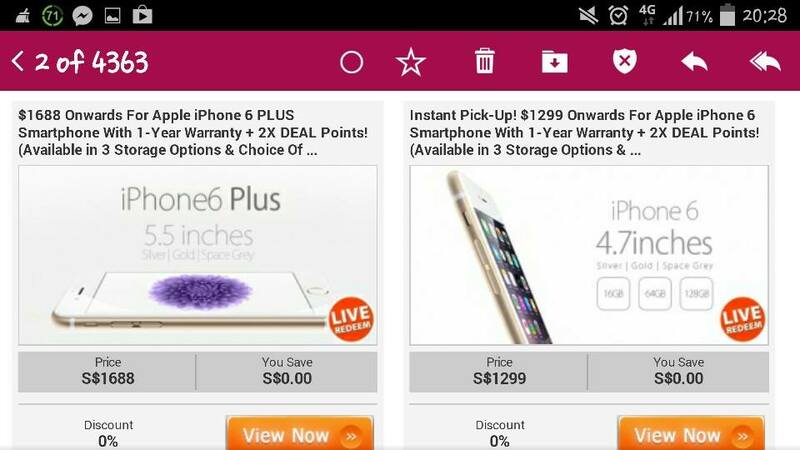 We are so excited with the latest gadget that is selling in Singapore from 1,300S$ to 1,700S$ (based on the deals promotion in the picture above). But worse is that in the Philippines I heard that it was ranging as high as 3,000S$. Do you have emergency fund (3-6 months for single people and 6-12 months for married people)? Do you have savings in the bank? Do you have investments (e.g., ETF, MF, Stocks, etc.)? The sad part is that this techie person just to be with the “in” crowd may even purchase the new IPhone using a credit card and that his credit card is already hovering in the credit limit once the transaction is approved. The sadder part is that in the next 1 year a new and more hi-tech phone will come out. Do we really have to jump in and join the band wagon every time there is a new gadget on sale? It is very difficult to keep up with the Joneses (or in the Philippine setting with the Pedro’s and Maria’s) and in the long run we may end up buried in debt, no savings, no investments and we are only relying on the measly SSS pension during our retirement and worse still is we are relying on our children and relatives during our twilight years. On a lighter note, did you know that Jaime Zobel de Ayala, the patriarch of the Ayala family, uses a very basic Nokia cellphone? SIMPLIFY – maybe this is something that we can take away from the rich and philanthropic Don Jaime.